Dubai's Roads and Transport Authority (RTA) has unveiled 50 Tesla electric vehicles that will be added to the limo fleet of the Dubai Taxi Corporation. The launch event was attended by Sheikh Ahmed bin Saeed Al Maktoum, President of the Dubai Civil Aviation Authority, Chairman of Dubai Airports, and Chairman of the Dubai Supreme Council of Energy, as well as Mattar Al Tayer, Director-General and Chairman of the Board of Executive Directors of RTA. "The RTA has recently taken delivery of 50 Tesla vehicles as part of a deal for 200 vehicles signed last February on the sidelines of the World Government Summit 2017," Al Tayer said. "Accordingly, 75 vehicles will be supplied in 2018, and 75 others to be delivered in 2019. The Dubai Taxi Corporation has coordinated with the concerned parties to provide the needed infrastructure to ensure the operation of these vehicles including the provision of 13 electric recharging stations." 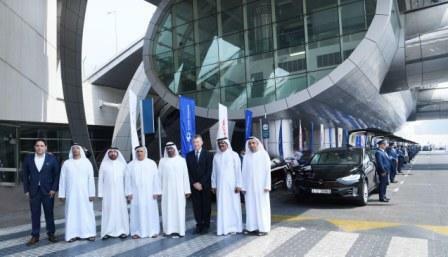 Al Tayer added that the vehicles come in two models, the (S) sedan model, and the (X) SUV model of Tesla vehicles. "Model (S) has garnered the largest possible rating of safety at the time of launch as it can cover the longest distance amongst electric vehicles. Besides its performance & facilities, Model (X) has a unique feature as it is fitted with falcon wing doors, panoramic windshield, a seven-seat configuration that provides an unprecedented level of comfort, and maneuverability," he explained. "Both models can benefit from the free over-the-air software updates that add new features and functionality over time. Besides deploying robust electric vehicles, Tesla has also designed a new and unique series of power generation and storage such as Powerwall and Powerpack technologies and batteries. When combined, the three key components can make a positive impact on the world: electric cars, renewable energy and batteries," he added. Additionally, Al Tayer noted that both models come equipped with the hardware needed for "full self-driving capability at a safety level greater than that of a human driver." "Tesla's Autopilot is designed as a hands-on experience to give drivers more confidence behind the wheel, increase their safety on the road, and make highway driving more enjoyable by reducing the driver's workload," he said. Following the event, Sheikh Ahmed and Al Tayer boarded one of the vehicles for a short tour. Last year, Tesla developed a hybrid system for the generation and storage of solar energy, and broadened the company's efforts to manufacture heavy vehicles and trucks. The company also improved its autonomous driving systems, shifting from semi-autonomous to fully autonomous systems, and is currently working on improving shared transport through the development of service systems for future generations.